Mauricio Pochettino should reject any approach from Manchester United in order to stay at Tottenham, according to Arsenal boss Unai Emery. Jose Mourinho's two-and-a-half-year tenure at United came to an end on Tuesday, as he was sacked with the Red Devils sitting sixth in the Premier League, 19 points adrift of leaders Liverpool, with the club confirming they would hire an interim manager before appointing a permanent successor at the end of the season. 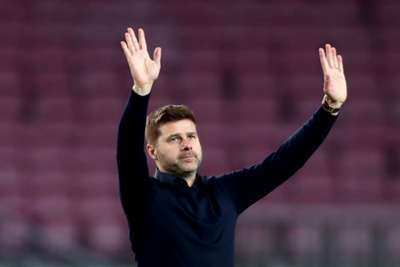 Pochettino has long been linked with the Old Trafford job, having overseen Tottenham's transformation to regular Champions League participants since his arrival from Southampton in 2014. However, Emery – whose Arsenal side face Tottenham in an EFL Cup north London derby on Wednesday – has urged his counterpart to stay put. "I think he's very happy at Tottenham," Emery told a news conference. "I think he's coaching a very big team with very big players and now they are in the Champions League they are also in a better position in the Premier League than Manchester United. "I think his performance at Tottenham is very big. "I don't know if he's thinking to change for another club, but I am looking at him with a very big commitment to Tottenham and he's creating a good performance, a good idea at Tottenham. Tottenham improved a lot with him. "Their level now is very big. They have very good players, the coach is working very well, they are winning a lot of matches. "When they are on the ball they are a very organised team, movement, they like a lot to be in possession, progress with the passes, with quality, are physically very hard and have attacking players with very big performances now." Wednesday's encounter will be the second time the sides have met this season, with Arsenal coming out on top in the Premier League on December 2, winning 4-2 at Emirates Stadium. Arsenal have faltered somewhat since that result, however, and a 22-match unbeaten run came to an end with a 3-2 defeat at Southampton on Sunday. Tottenham, meanwhile, have won their last three league games, as well as securing progression into the last 16 of the Champions League with a 1-1 draw at Barcelona, and Emery is expecting a response from Pochettino's side. "We need to do a big match and I think it will more difficult than the first," Emery added. "It's a very big test and also they are coming with a very big ambition against us because after the first derby they need to show us and their supporters a big performance. "I think is a very good match for the supporters, very big match for the players and a very big match for us, the coaches, also."